This is a dish I had posted way back, but I still go back to it as it was one of my absolute favourite dishes that I've ever made. You can see all the other delicious servings that went along with this beautiful piece of pork here. To save myself a bit of the work though, I had the butcher cut a slit in to middle of the pork loin so I could stuff it but I ended up deciding to roll it too. I simply slice the ends open to butterfly the pork loin. You can also ask the butcher to butterfly it for you but I changed my mind to butterfly after the fact. The butcher also scored the fat top of the pork loin for me. I seasoned both sides of the pork loin with some salt and pepper and rubbed each side with olive oil. To prepare the stuffing I used was a boxed cranberry stuffing (I’m no miracle worker I needed to leave something to be quick preparation), but I mixed it with some onions caramelized with apples and balsamic vinegar. Yum! 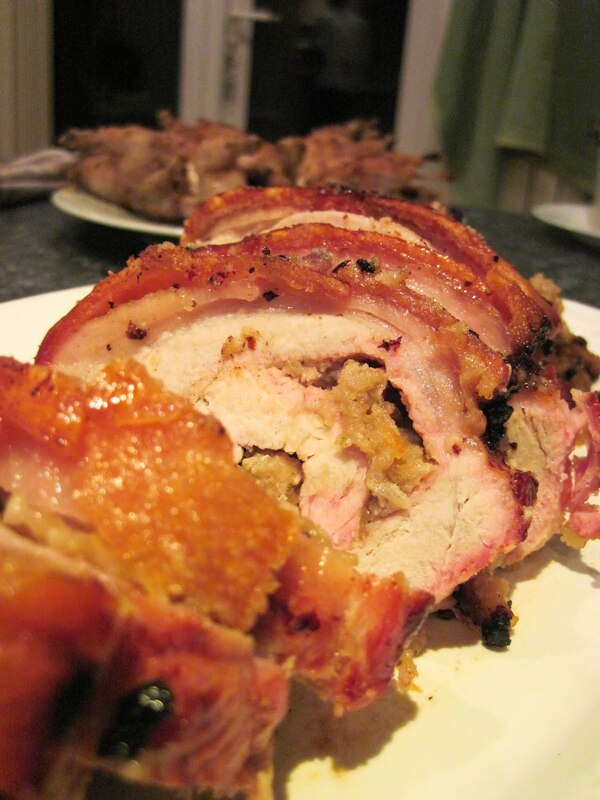 I spread the stuffing over the flesh side of the pork loin then simply rolled it (like a jelly roll). This is a seriously delicious pork! Just try and you'll see.